NOTE: YOU CAN STILL REQUEST YOUR INVITATION FOR PRELAUNCH OPPORTUNITIES! Treasure Hunt Giveaway - $150 Value Prize! check out the blogs listed on the web ring at the end of this post. send me an email NO LATER THAN OCTOBER 29th, with your list of 50 clues and the blog where you saw each, plus your first and last name and email address. on October 31st the drawing will be held, and the winner notified by email! HERE ARE SOME TIPS: This is a Treasure Hunt, which means you will need to LOOK for clues. The clues will always be in a post that contains the "Christmas in a Box" picture shown above. Each link on the link list at the end of this post will take you to a blog's home page, and you will need to find the post that contains the Treasure Hunt Clue...don't expect it to just show up first thing. But here's a little hint, the hunt officially started August 20th, so you should not have to go back any farther than that to find clues :-) And finally, if you don't find 50 clues right away, come back and check the Link List at the end of this post again, as more clue blogs are being added daily! 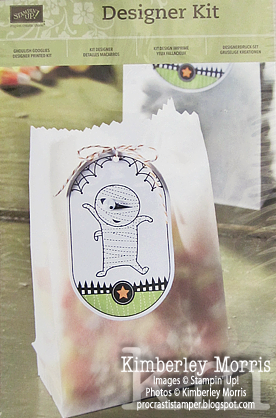 The Ghoulish Googlies Designer Kit includes a set of 20 printed tags, a set of 50 self-adhesive googlie eyes, 10 glassine mini bags, and 10 pieces of Pumpin Pie/Whisper White Baker's Twine (exclusive to this kit). The kit coordinates with the Ghoulish Googlies Wood-Mount stamp set, and Clear-Mount stamp set. AND--you can purchase the kit and stamp set together in the Ghoulish Googlies Wood-Mount Bundle and save 15%!!! (Clear-Mount Bundle also priced with savings) FYI: no purchase is necessary to enter the Treasure Hunt! Just to recap, I usually take my Make & Takes home to assemble them, so I can take my time, and even tweak the projects a little. For instance, on the box, the instructions were to use actual ribbon down the sides of the box that has the paper ribbon on top. To me, that change in texture was really distracting, so I just added more of the same color card stock I used to make the paper ribbon. And, I wasn't super excited about the colors for the cards, so I subbed in Soft Suede instead of Early Espresso for the brown, and varied my cards slightly. By the way, the coordinating Floral Frames Framelits will cut 4 of the 5 images from the Daydream Medallions stamp set, so that's a great companion buy! Also, there were 4 envelopes provided for the cards, which you do not see in my finished project. 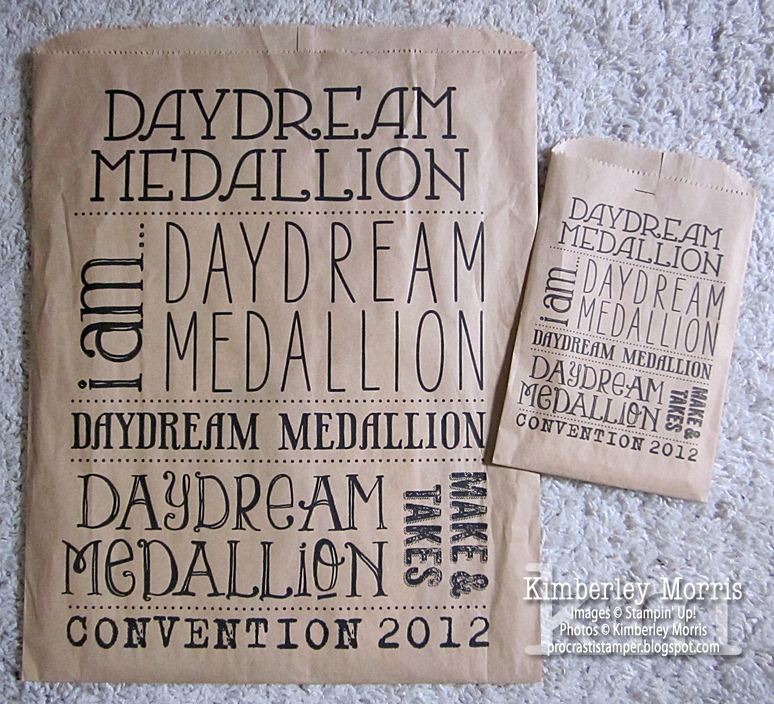 The Make & Take sample picture and instructions called for using the coordinating Daydream Jumbo Wheel over each of the envelope flaps. Another small note, if you are thinking of getting the Daydream Medallions set: do NOT throw away the circle and ring shaped rubber pieces that come in the center of the medallion images. They make great polka dots! I chose the clear-mount Daydream Medallions set, so it's super easy to just pop any of the images onto an acrylic block to use them. 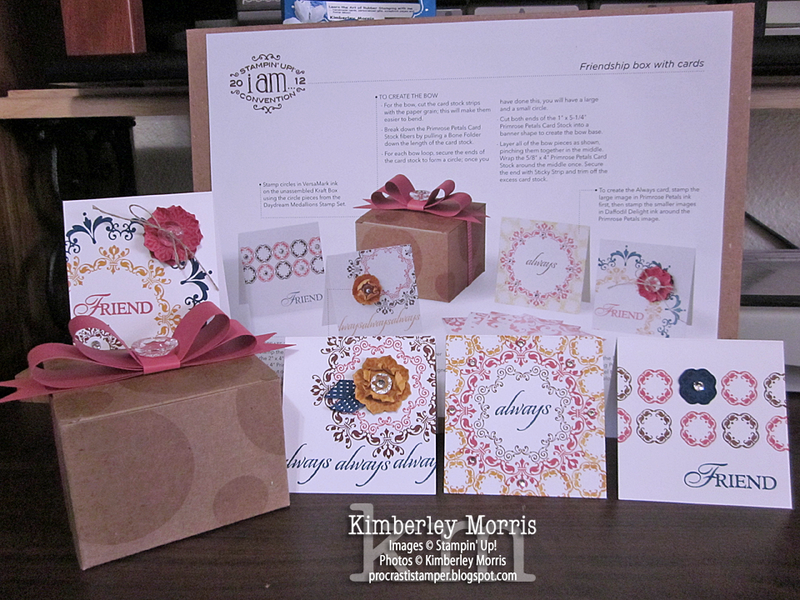 You'll see the polka dots on the card box for this project, inked up with VersaMark ink. Feel free to email me if you have any questions, or would like help with your order. And you are always free to order from my ONLINE STORE anytime 24/7. The Stampin' Up! 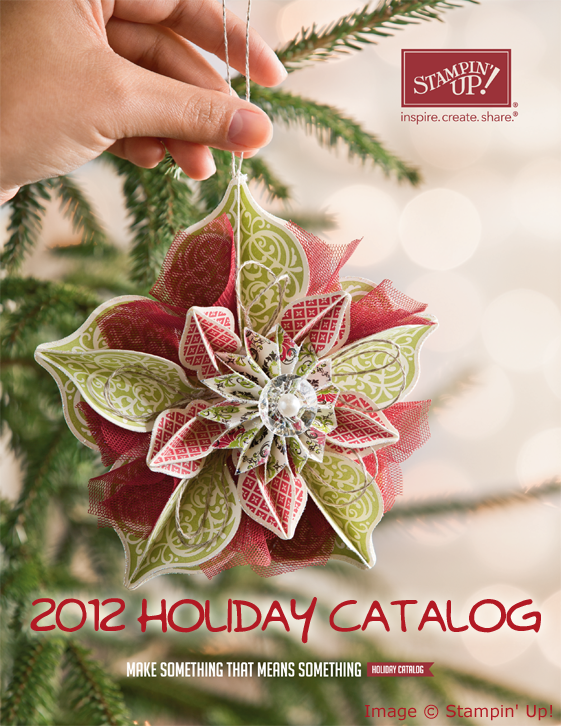 2012 Holiday Catalog has debuted! You may order from this catalog from August 1st, 2012 through January 2nd, 2013. BUNDLES OF SAVINGS: At the bottom of page 2, just inside the *beautiful* front cover, you will find a Save with Bundles index. The index lists coordinating products which have been bundled together at a savings! 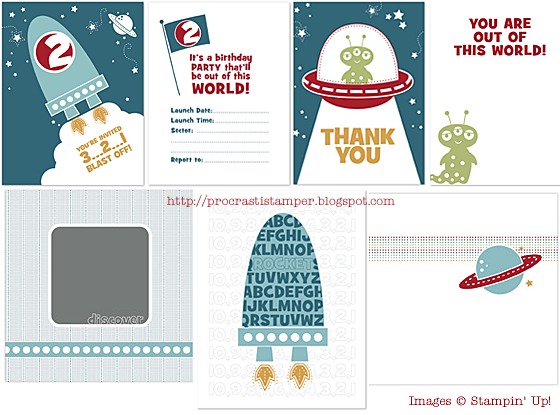 STAMP & CUT COMBOS: On page 3, you will see the first of our stamp & cut combos. These are stamp sets with coordinating cutting accessories! The Ornament Keepsakes stamp set images can ALL be cut out with the Holiday Ornaments Framelits Dies, plus a 1" Circle Punch. This combo was used to create the dazzling paper ornament on the front cover. PRODUCT SUITES: On page 3, you will also see the first of our 2012 Holiday Catalog Product Suites. Coordinating items in the Candlelight Christmas Product Suite are featured from pages 3-5. The Snow Festival Product Suite appears on pages 10-12. My favorite, the Howlstooth & Scaringbone Product Suite can be found on pages 24-25. And finally, the Orchard Harvest Product Suite is on pages 28-30. EMBELLISHMENTS GALORE: I want to make sure you notice all the tactile goodies detailed in this catalog. Check out the 3-1/2" Scalloped Tulle Ribbon in your choice of 3 colors on page 4, the yarn Sweater Trim (in 3 different colors) at the bottom of page 11, the Stitched Felt Ornaments at the bottom of page 12, the stampable 7/8" Cotton Ribbon in the middle of page 20, the 1/2" Striped Satin Ribbon that looks like black & grey witch's stockings on page 26, 5mm Googlies on page 27 to add googly eyes to your projects, round Designer Ribbon Slides at the bottom right on page 31, and Brushed Bronze Designer Buttons at the bottom of page 32. EMBOSSING FOLDERS & POWDERS: Embossing folders for the Big Shot are among my favorite accessories, and you'll find 3 new ones in the Holiday Catalog! Try the Lacy Brocade Textured Impressions Embossing Folder on page 6, the Holiday Frame Textured Impressions Embossing Folder on page 7, or the Woodgrain Textured Impressions Embossing Folder on page 33. If you prefer heat embossing, you'll love the Gumball Green Stampin' Emboss Powder and the Early Espresso Stampin' Emboss Powder on page 32. And if you want to incorporate some holiday scents in your projects without slaving in the kitchen for hours, try either the Sugar & Spice Scented Stampin' Emboss Powder or the Peppermint Sticks Scented Stampin' Emboss Powder from page 16. GLIMMER, SPARKLE, and SHINE: If you're into glitz, take note of the silver Flourish Designer Frames and silver 1/8" Mini Brads on page 8, the lush champagne Glimmer Paper on page 18, the Stampin' Dazzle Markers in silver and gold on page 19, the new Illuminate Glimmer Watermark Stampin' Pad as well as the silver Dazzling Details glitter glue on page 23, and finally--some shiny Gusseted Cellophane Bags on page 34. CUT IT OUT: So, I already mentioned the Stamp & Cut Combos above, but I want to make sure I point out that any of the images you see in the catalog that have colored outlines around them have a coordinating punch or die. I think the dies are featured fairly prominently, but also take note of the Merry Minis Punch Pack on page 6, the 1-1/4" Scallop Circle Punch on page 7, and the Mitten Builder Punch on page 11. FLOCKING & FABRIC: On page 4 you'll find our Candlelight Christmas Specialty Designer Series Paper, featuring 2 Flocked Window Sheets! And there are a couple of new fabrics to choose from in this catalog. A festive Candlelight Christmas Designer Fabric on page 4, and an autumnly rich Orchard Harvest Designer Fabric on page 30. PRE-PRINTED PRODUCTS: If you aren't into stamping, you can still enjoy our exclusive designs in our pre-printed products. Aside from our usual 12x12 patterned papers, the Holiday Catalog features the Festival of Prints Designer Series Paper Stack on page 20, which is a pad of 48 sheets which are 4-1/2" by 6-1/2". The pad of 25 double-sided Snow Festival Designer Printed Tags on page 12 might also come in handy. For scrapbooking, try the Merry Moments Simply Scrappin' kit on page 9, or the Snowflake Season Simply Scrappin' Layout Kit on page 21. Bake a dozen cookies and give them as individual gifts using the Season of Sweets Designer Kit on page 15, or just share your holiday photo with the laser cut Noel Notes Simply Sent card kit on page 17. Get a few calendars for those folks on your gift list who have everything else--they'll love the 2013 Everyday Happenings Designer Calendar with coordinating Desktop Display Calendar Case. Don't forget the Halloween treats, your recipients will foam at the mouth over treats packaged with the Ghoulish Googlies Designer Kit on page 27! Speaking of sweets, be prepared for those precious moments with the Sealed with Love Simply Sent love note kit (this will be available thru Feb 14th, 2013...I'll remind you again later). I know, I know, the Holiday Catalog is SO AWESOME, isn't it?!? Well, if you're like me, you LOVE just about everything in there. Luckily, Stampin' Up! offers super Hostess Dollars for "party" events, as well as Stampin' Rewards for online orders. Just email me to find out how you can earn a bunch of these great new products for FREE! 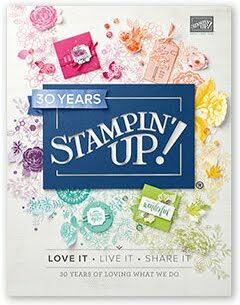 You can place an online order anytime and get Stampin' Rewards, or if you are local to me then you can host a private class or a drop-in project and earn Hostess Benefits. If you are busy and just want to show catalogs around and get orders from your crafty friends, ask me about a "book party". 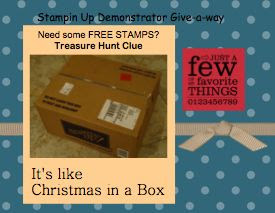 If your kids are going back to school, I'm happy to help organize a fund raiser with Stampin' Up! products. Contact me today for a one-on-one FREE Project Planning Consultation, and I can help you choose the best products for your needs and budget. And, of course, if you have to have it right away, you can SHOP MY ONLINE STORE anytime, 24/7. If you have any problems or questions, just call or text, and let me know you are having "ordering issues" and I will give you a priority call-back! UPDATE: This SALE has been extended through September, 14th, 2012!!! ...and one more DIGITAL SALE item HERE. which is our brand new, updated digital designing software--just released today! There is a lot of variety in the digital content that's on sale this month, so be sure to check out those links at the top of this post to view all 31 of them! The Blast Off Ensemble is great for kids (or just the young-at-heart space lover), and includes a 34-page board book template. 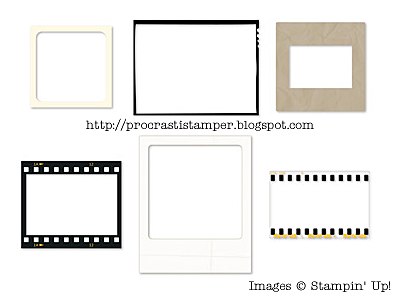 The Candid Frames are hot, hot, hot right now--you just drop a picture in the center, and bam, instant print! 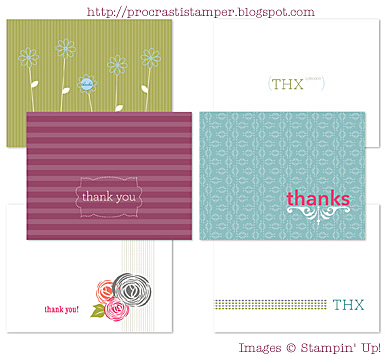 And the Thanks Tons Greeting Card Templates download features 6 different customizable card templates. Design and print 30 of your own 'thank you' cards at a 31% discount during August, and set your own personal Gratitude Challenge to send out a card a day for a month (November is an awesome month for that, by the way). All professionally printed greeting cards come with their own envelope, just jot a quick personal note on the card, pop it in the envelope, and slap on a postage stamp, and your thanks are ready to be delivered!